In these uncertain times, China has a reason to reconsider its relationship with India and its policy of keeping up a hostile, damaging posture. It may be time for China to start looking for cooperation and mutual benefit everywhere it can, while it tries to find a sure footing to grapple with the American sumo. China’s economic growth and its rise as an industrial powerhouse have been nothing short of staggering. What is vital to note is that China became a powerful rival to the United States (US) without bothering with democracy, human rights, freedom of speech, intellectual property rights, or political dissent. When China opened itself for business, arranging labour, infrastructure, subsidies, and policies to make Chinese labour a hugely scalable export commodity, American companies got busy thumping the Bibles of free trade and globalisation, shipping off their manufacturing to China and raking in bonuses for chief executive officers (CEOs) and the profits for Wall Street. The American government got busy borrowing money from China to finance American spending on everything from Chinese-made consumer electronics to its wars without end. ON THE 26th floor of an iconic glass skyscraper, nicknamed the “Trousers”, in Beijing’s main business district, half a dozen casually dressed 20-somethings gather in a rainbow-coloured lounge, chatting away on ergonomic chairs. The office has the vibe of a hip tech startup. 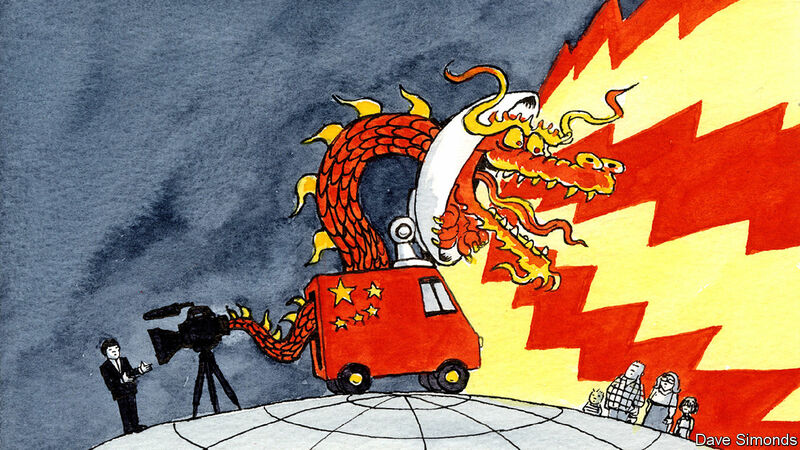 In fact, it is the headquarters of the country’s foreign-language television service, which rebranded itself in 2016 as China Global Television Network (CGTN). The young staff are Chinese who have studied abroad and are proficient in one of the network’s five languages—English, French, Spanish, Arabic and Russian. CGTN is at the forefront of China’s increasingly vigorous and lavishly funded efforts to spread its message abroad. Xi Jinping, the president, has told the station to “tell China stories well”. The Trump administration is right to push back against China's violations of world trade rules, particularly with regard to advanced technologies. But US high-tech industries' ability to weather the challenge posed by China will depend less on curbing China’s progress, and more on supporting innovation at home. With its ambitious Made in China 2025 strategy, China has made clear its objective to secure global economic leadership in advanced technology industries. This places it in direct competition with the United States – which currently leads in those industries – in what is emerging as an undeclared but intensifying cold war over technologies with both commercial and military applications. After decades of artfully swindling American experts and businesses, the Chinese government is beginning to face a reckoning. Last week, President Trump announced that tariffs in response to China’s systematic theft of U.S. intellectual property will commence on July 6th. The levies of twenty-five percent will apply at first to $34 billion in Chinese imports, later expanding to $50 billion. That will only affect about ten percent of what America imports from China each year, but the move marks a fundamental turning point. At long last, something is being done about trade and intellectual property theft by China. Ever since commerce between China and the West began in earnest, foreign officials and businessmen have been unable to resist the allure its huge market of would-be consumers—currently numbering 1.4 billion. This siren’s call continues to be answered despite unending evidence that China would never allow “barbarians” a major stake in its domestic economy, and indeed wants handsome compensation just for access to this market. China is pushing ahead with modernising its nuclear weapon delivery systems and has added to its arsenal as it boosts military expenditure, according to a report released by an independent think tank on Monday. As of January, the country had 280 warheads, up from 270 a year earlier, the Stockholm International Peace Research Institute (SIPRI) said in an annual report. But it said none of the nuclear warheads were deployed on missiles or located on bases with operational forces. They were instead classified as “other warheads” – meaning they are being stored or have been retired. China is the world’s second biggest spender on military, allocating US$228 billion for defence last year – up 5.6 per cent from 2016. That was its lowest increase in military spending since 2010, but was in line with gross domestic product growth and inflation. A protester at a rally on the Philippines' 120th Independence Day at the Chinese consulate in Manila on June 12, 2018. The protests focused on China's bullying and militarization in the West Philippine Sea. Once again, the Scarborough Shoal dispute is threatening to torpedo Philippine-China relations. Two years into office, Philippine President Rodrigo Duterte is facing a widespread public backlash over reports that the Chinese coast guard is controlling the contested shoal and surrounding areas and routinely harasses Filipino fishermen. Despite Western sanctions and oil-price volatility, Russia is currently on sturdier economic footing than most of its critics ever could have imagined just a few years ago. But while prudent fiscal and monetary policies have laid the groundwork for long-term sustainable growth, the government must resist the temptation of short-term stimulus. MOSCOW – Russia has a way of illustrating universal problems. Consider the goal of economic development. Political leaders have an interest in delivering economic prosperity very quickly, and yet the policies needed to enable sustainable long-term growth can take quite a while to bear fruit. The political and policy clocks are rarely synchronized. Aristotle famously contrasted two types of knowledge: “techne” (technical know-how) and “phronesis” (practical wisdom). Scientists and engineers have offered the techne to move rapidly from fossil fuels to zero-carbon energy; now we need the phronesis to redirect our politics and economies accordingly. The climate crisis we now face is a reflection of a broader crisis: a global confusion of means and ends. We continue to use fossil fuels because we can (means), not because they are good for us (ends). This confusion is why Pope Francis and Ecumenical Patriarch Bartholomew are spurring us to think deeply about what is truly good for humanity, and how to attain it. Earlier this month, the pope and patriarch each convened business, scientific, and academic leaders, in Rome and Athens, respectively, to hasten the transition from fossil fuels to safe renewable energy. Immediately after U.S. President Donald Trump and North Korean leader Kim Jong Un signed a joint declaration at the end of last week’s summit in Singapore, I received a harsh assessment of the meeting from a conservative colleague in South Korea. In his view, the summit was “a total failure. 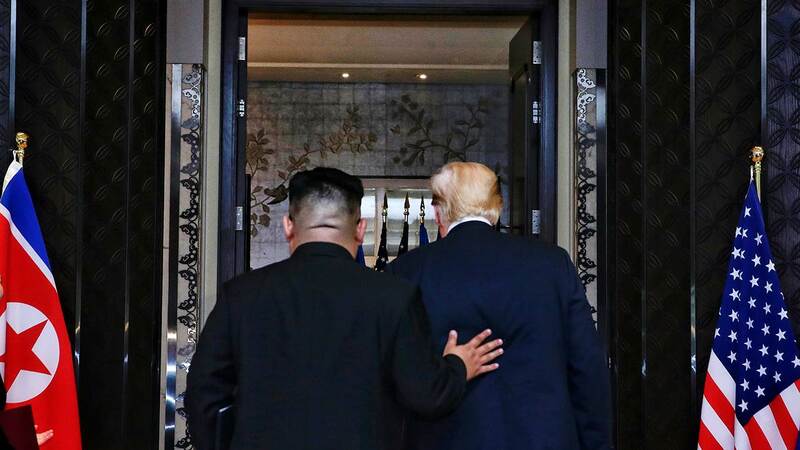 They failed to agree on CVID [complete, verifiable, and irreversible denuclearization]. It is a victory for North Korea.” Other experts in Seoul raised concerns about the future of the U.S.–South Korean alliance following Trump’s abrupt announcement that South Korean–U.S. “war games” would be suspended, as well as his decision not to raise the issue of human rights with Kim. In this sense, there is a paradoxical similarity between South Korean conservatives’ and the American liberal mainstream’s criticisms of Trump and his agreement with the North Korean leader. The cabinets of Germany and France are set to meet on Tuesday, but the two countries remain far apart when it comes to eurozone reform. Paris is disappointed with Germany's response to Emmanuel Macron's proposals. The staging was similar to that of French President Emmanuel Macron's groundbreaking speech on the need for European Union reform delivered at the Sorbonne last fall. Surrounded by a handpicked audience, German Foreign Minister Heiko Maas spoke last week about the lessons that Europe must draw from the policies being pursued by U.S. President Donald Trump. 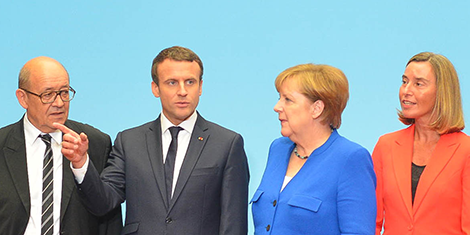 Maas demanded that Germany "join forces with France" and said that, "given the uncertainty in trans-Atlantic relations in particular, it must be absolutely clear that we are working hand in hand." It has taken almost 25 years to get an agreement between the governments in Athens and Skopje on what to call the entity once known as the Former Yugoslav Republic of Macedonia. It would be a mistake to dismiss this as a minor development — particularly now, when the unity of the trans-Atlantic alliance is at its lowest point since World War II and the unity of the European Union is under challenge in every national election. In fact, the historic compromise to rename the country the Republic of Northern Macedonia, thus softening a rivalry over national histories, opens a window of opportunity for leaders in Europe and the United States to defy current trends and begin shaping a secure future for the Balkans, an achievement that would help secure stability for all of Europe. The Western world owes its success since the end of the Second World War to its well-functioning system of institutions. The North Atlantic Treaty Organization protects against military aggression; the World Trade Organization establishes rules on how to do business with each other; and the International Monetary Fund and the World Bank help stabilize international finance and fight economic and humanitarian crises. Finally, the United Nations and the G-7 safeguard a platform for crucial conversations among world leaders as tensions loom -- they ensure that problems are faced before they escalate. WEST LAFAYETTE, INDIANA: After canceling a summit with North Korea, President Donald Trump must set realistic goals. Most urgently, he must back off from the idea that Pyongyang might be amenable to discarding its nuclear weapons or missile-delivery systems. At best, Kim Jung-un's definition of "denuclearization" is limited to temporarily halting his country's already effectively completed schedule of nuclear testing. Although Kim has made vague hints in the past that his country would consider eliminating its nuclear weapons in tandem with "denuclearization" of the Korean Peninsula, there is little reason to believe that he would go meaningfully beyond a promised cessation of nuclear weapons testing. In the middle of the twentieth century, people feared that advances in computers and communications would lead to the type of centralized control depicted in George Orwell’s 1984. Today, billions of people have eagerly put Big Brother in their pockets. Information revolutions are not new. In 1439, Johannes Gutenberg’s printing press launched the era of mass communication. Our current revolution, which began in Silicon Valley in the 1960s, is bound up with Moore’s Law: the number of transistors on a computer chip doubles every couple of years. By the beginning of the twenty-first century, computing power cost one-thousandth of what it did in the early 1970s. Now the Internet connects almost everything. In mid-1993, there were about 130 websites in the world; by 2000, that number had surpassed 15 million. Today, more than 3.5 billion people are online; experts project that, by 2020, the “Internet of Things” will connect 20 billion devices. Our information revolution is still in its infancy. Drawing upon decades of experience, RAND provides research services, systematic analysis, and innovative thinking to a global clientele that includes government agencies, foundations, and private-sector firms. The Pardee RAND Graduate School (PRGS.edu) is the largest public policy Ph.D. program in the nation and the only program based at an independent public policy research organization—the RAND Corporation. 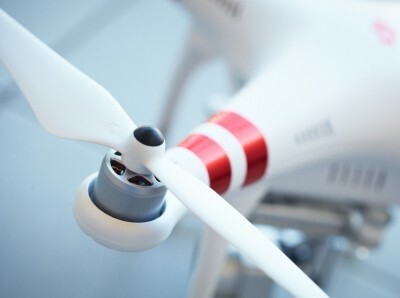 In late April, a toy drone buzzed past the palace of the king of Saudi Arabia, leading Saudi security forces to shoot it down. Online, a story spread quickly across the Internet that the Saudi royal palace was under siege and a full-fledged coup was in progress. Given the recent crackdown and imprisonment of wealthy and influential Saudis engineered by Saudi crown prince Mohammed bin Salman, the news was believable—at least initially. But in the end, just like the commercial drone, the story of the coup plot was also shot down, proved to be false and just another piece of the ubiquitous disinformation flotsam populating the World Wide Web. The Pentagon has quietly empowered the United States Cyber Command to take a far more aggressive approach to defending the nation against cyberattacks, a shift in strategy that could increase the risk of conflict with the foreign states that sponsor malicious hacking groups. Until now, the Cyber Command has assumed a largely defensive posture, trying to counter attackers as they enter American networks. In the relatively few instances when it has gone on the offensive, particularly in trying to disrupt the online activities of the Islamic State and its recruiters in the past several years, the results have been mixed at best. WASHINGTON — The Pentagon has quietly empowered the United States Cyber Command to take a far more aggressive approach to defending the nation against cyberattacks, a shift in strategy that could increase the risk of conflict with the foreign states that sponsor malicious hacking groups. Until now, the Cyber Command has assumed a largely defensive posture, trying to counter attackers as they enter American networks. In the relatively few instances when it has gone on the offensive, particularly in trying to disrupt the online activities of the Islamic State and its recruiters in the past several years, the results have been mixed at best.